Eureka Ergonomic is a brand with more than 150 passionate engineers working hard to solve your everyday ergonomic issues. Originally designed and manufactured by Eureka Ergonomic this electric sit stand desk was born. With our vertical X-lifting design you save valuable space while improving your work day. 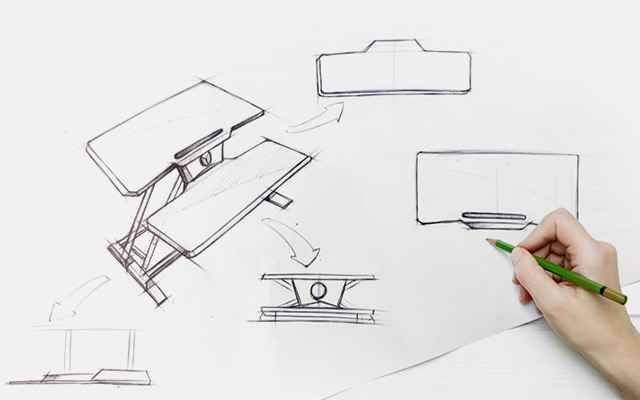 Scroll drown to learn more about our new electric sit to stand desk. 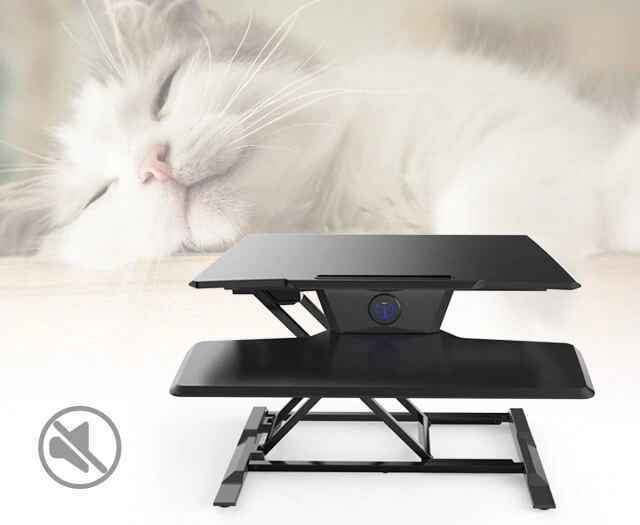 Or click the Buy Now button to experience this standing desk converter for yourself. Try risk free for 30-days. Plus, free shipping and free return shipping if you're not satisfied. The Eureka Ergonomic electric sit stand desk was designed based on the demand for a more effortless standing desk converter. With a touch of a button you can effortlessly raise or lower your sit stand desk. We have also add additional features such as a USB charging port for your phone or tablet. Stand up and bring your work with you. Effortlessly raise from seated to your perfect standing height. The X-lifting design allows you to stay at the same distance away from your desk while in your perfect sitting or standing position. 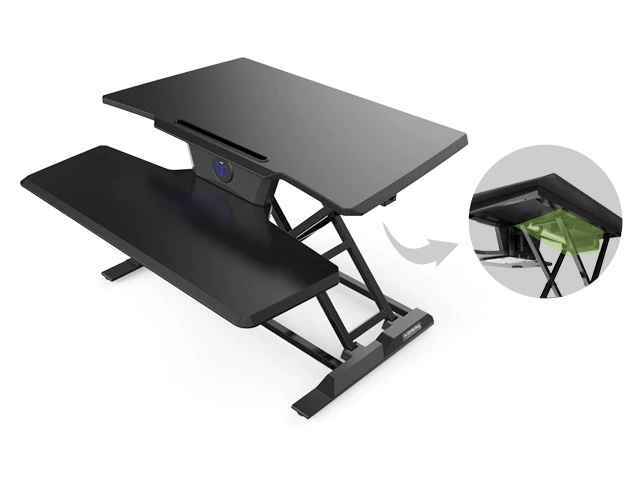 Pair this standing desk converter with a anti-fatigue mat and you'll have a perfect ergonomic workstation. No assembly required. Take your new standing desk converter out of the box and place it on your existing desk. Turning your work surface into a ergonomic workstation. Never have to worry about your monitor, laptop, and desk accessories while working on this sit to stand desk Converter. Utilizing a unique buffering system under the desktop. Our buffering system safeguards your stand up desk converter from suddenly slamming down while lowering your adjustable standing desk. No other sit to stand desk as a buffering system like this. Just another reason to order this electric sit stand desk and try it for yourself. The Eureka Ergonomic Electric Sit Stand Desk really stands out with its high weight capacity. Being rated at 50-60 lbs, rather than 30-40 lbs which is the average for the market. You could easily accommodate up to 3 monitors with the help of dual monitor arms. Review your options here at Eureka Ergonomic to find the product that fits you best. Please contact Customer Support if you need any help by using Live Chat to the right. Our engineers have thought of everything. To ensure the safety and longevity of your electric sit stand desk we have positioned the electric motor under the desktop. Ensuring the electronic components and motor are not subjected to damage and your safety. 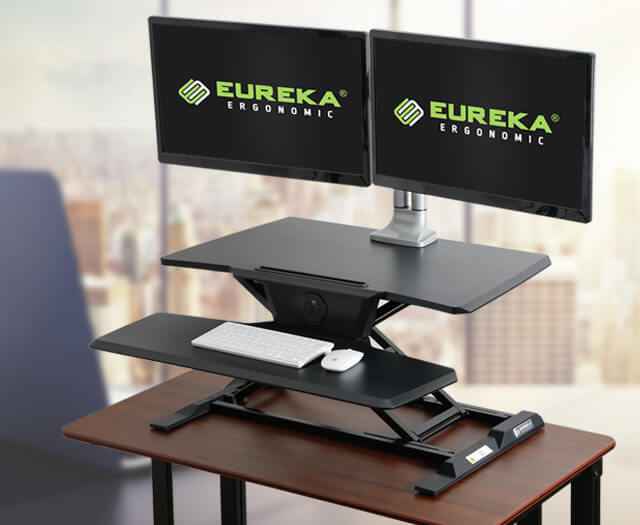 The Eureka Ergonomic electric sit stand desk has a large ergonomic surface area for your monitor, laptop, keyboard, mouse, and all your other important desk accessories. The ergonomic keyboard tray is the perfect size and shape. Attached a single monitor arm or dual monitor arm to free up valuable work surface and improve your work day. Stand up and bring your work with you. Effortlessly transition between sitting and standing while at work or in your home office with the space saving Eureka Ergonomic® Electric Sit Stand Desk. 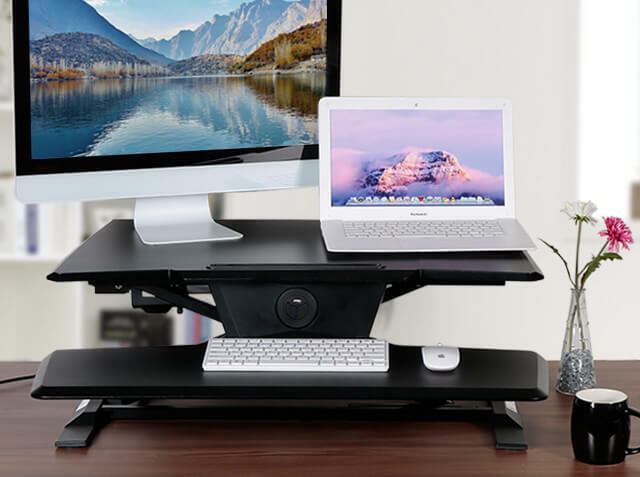 This standing desk converter utilizes the ultra quiet motor and strut to lift and lower your sit to stand desk. Your desk will always have a consistent speed with no wobbling during operation. Our electric sit stand desk converters are internationally certified to meet the highest safety and environmental standards. Your satisfaction is our top priority. 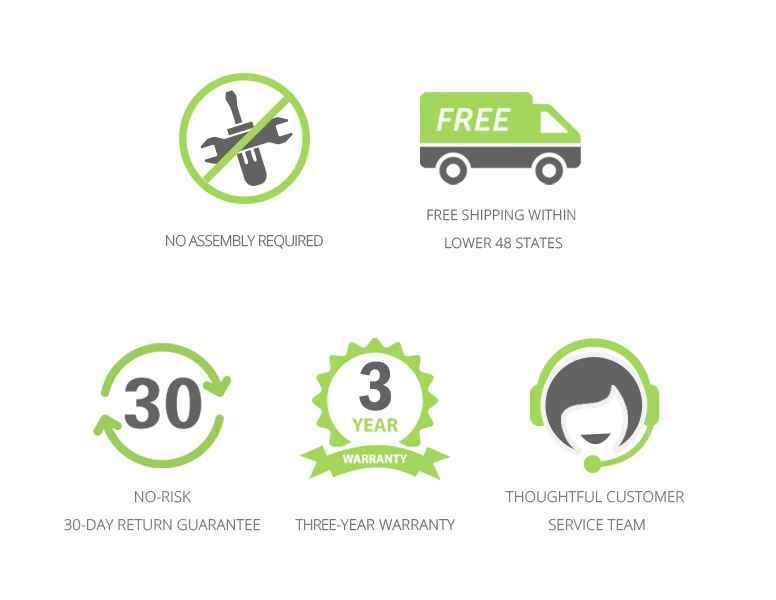 We make sure we're designing and manufacturing the best sit stand desks for sale. We hold our sit stand desk converters to a high standard and hope you have an excellent experience using our ergonomic desks. 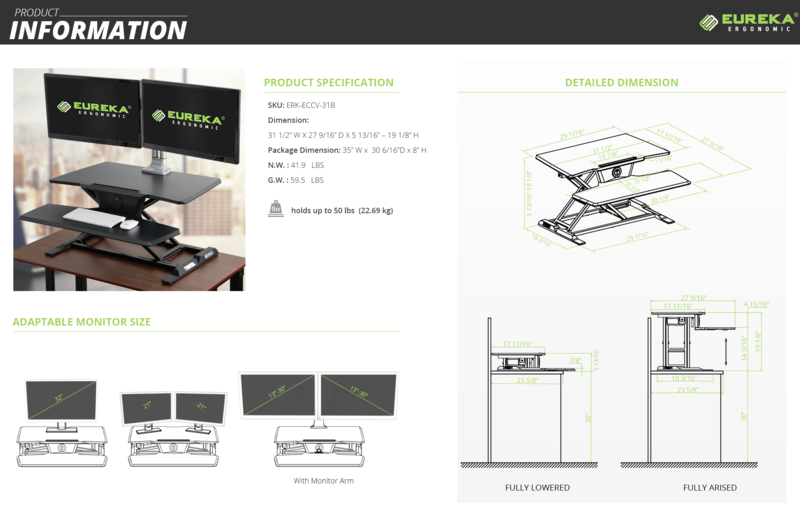 Here's some real reviews, by real shoppers about our height adjustable desks. We hope when you buy your first or next Eureka Ergonomic standing desk converter, adjustable standing desk, and office accessories you love them too. We're offering you a 30-Day Risk Free Guarantee. If you don't like it, just send it back. It's just that easy!